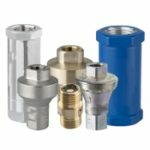 Proportion Air - Techmaster Inc.
Proportion-Air designs and manufactures electronic pressure regulators for a wide variety of applications. Pressure controls are available for very low pressure applications (down to 0-2 inches of water column), very high pressures (up to 1000psi direct electronic control), high flow rates (up to 4 inch pipe), ultra high resolution (up to 0.005% FS resolution), intrinsically safe (Factory Mutual Class 1 Div 1 and Class 1 Div 2), and low cost OEM style pressure controls. More Proportion-Air products below. Proportion-Air manufactures two types of flow control valves; closed loop mass flow control valves and open loop variable orifice flow control valves. The F-series mass flow transducer is the heart of the closed loop models. 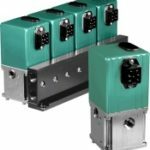 The F-series calculates flow based on differential pressure which results in very fast flow measurements. This flow can be connected to Proportion-Air’s pneumatic control valves as a feedback loop for closed loop control. The FCV (Flow Control Valve) is a variable orifice angle seat design. The FCV closes the loop around an internal valve position with an integral LVDT. The position of the valve directly correlates to valve flow capacity (Cv) based on careful design of the parabolic valve plug geometry. Proportion-Air offers a complete line of miniature safety regulators designed with safety and performance in mind. These safety regulators are intended to protect people, tools and machines from excessive (and often dangerous) air pressure. Need to limit the air pressure to your brand new impact wrench? Would you like to protect your employees from pneumatic hose breaks? How about pre-regulating pressure to one of Proportion-Air’s ultra-low pressure electronic regulators? Maybe, you just want to limit the pressure to your CNC machine and prevent workers from turning it up too high? Answer YES to any of these, click here to learn more or contact us for ordering. Proportion-Air builds only electronic pressure and electronic flow control valves. Each control valve we build is carefully selected based on each customers unique application parameters. Often, a standard catalog valve just isn’t a good fit. Rather than have you design around a catalog valve, Proportion-Air likes to work with each customer to see if modifying our existing technology could provide you with a better solution. See how Proportion-Air can quickly and cost effectively help you engineer a control valve right for your application. 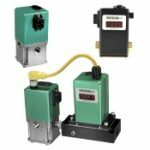 Often called air volume boosters, Proportion-Air manufactures or represents many types of pilot operated regulators to fit your application’s unique parameters. Both piston operated and diaphragm operated volume boosters are offered. Models are available for high pressures, ratio operation (1:1, 2:1, 15:1, 45:1 and more), steam temperature control, vacuum pressure control, very low pressure control, and for high temperatures. Air piloted regulators are also available in a wide variety of body and elastomer materials for oxygen clean/oxygen compatibility or for corrosive applications. 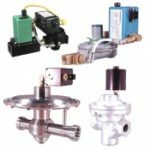 Proportion-Air manufactures and supplies accessory equipment for the operation of your electronic pressure or electronic flow control valve. AC to DC power supplies, analog command signal sources, control valve mounting brackets, pre-wired power cords, ultra-sonic distance sensors, and panel meters to display the pressure or flow readings are available.